The Temple of Artemis, also known less precisely as the Temple of Diana, was a Greek temple dedicated to a goddess Greeks identified as Artemis and was one of the Seven Wonders of the Ancient World. It was situated at Ephesus (near the modern town of Selçuk in present-day Turkey), and was completely rebuilt three times before its eventual destruction in 401. Only foundations and sculptural fragments of the latest of the temples at the site remain. The first sanctuary (temenos) antedated the Ionic immigration by many years, and dates to the Bronze Age. Callimachus, in his Hymn to Artemis, attributed it to the Amazons. In the 7th century the old temple was destroyed by a flood. Its reconstruction began around 550 BC, under the Cretan architect Chersiphron and his son Metagenes, at the expense of Croesus of Lydia: the project took 10 years to complete, only to be destroyed in an act of arson by a young arsonist seeking fame named Herostratus. It was later rebuilt. 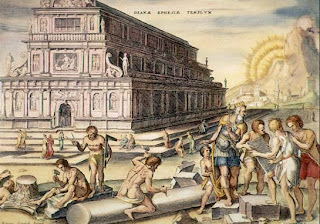 The "Croesus" Temple was destroyed on July 21, 356 BC, probably very soon after its completion, in a vainglorious act of arson: one Herostratus set fire to the roof-beams, seeking fame at any cost, thus the term herostratic fame. A man was found to plan the burning of the temple of Ephesian Diana so that through the destruction of this most beautiful building his name might be spread through the whole world.